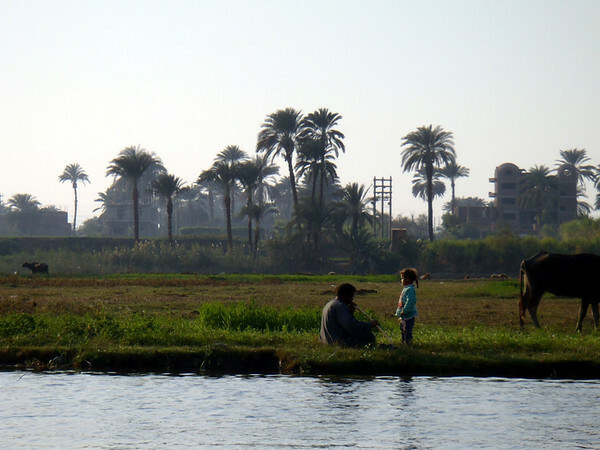 There was more sightseeing to be done in Luxor, starting with a cruise on the Nile aboard a felucca (info link). Like the drivers in Wadi Rum, the felucca captains were a constant presence along the corniche, offering rides anywhere from one hour to several days in duration. One captain stood out from the rest with a unique sales pitch, quoting The Bard himself: “To be, or not to be?” A refreshing change from “Felucca-felucca-felluca-good price-good price for you!” I chatted for a while with this fellow, who was an English student at the university in the late 1960s. He proclaimed a love for the English language, and proceeded to impress me by quoting more Shakespeare with British, French and Italian accents. 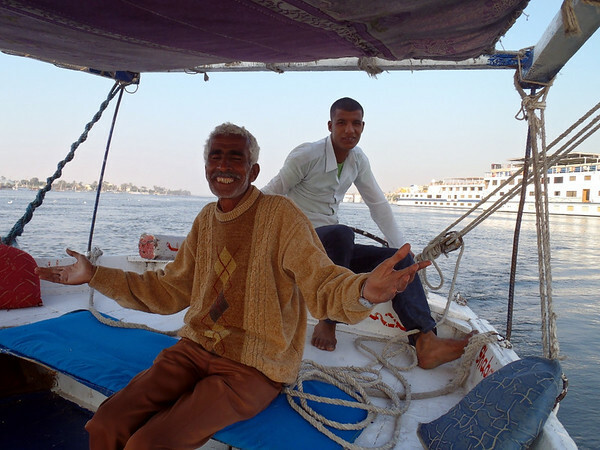 Even the other felucca captains called him William Shakespeare. We negotiated a price for a one hour ride on the big river, and walked down to the docks to the line of waiting boats. William Shakespeare and first mate. The sail was unfurled and the gentle breeze took us out close to the west bank, where instead of hotels and restaurants, locals carried on with life. 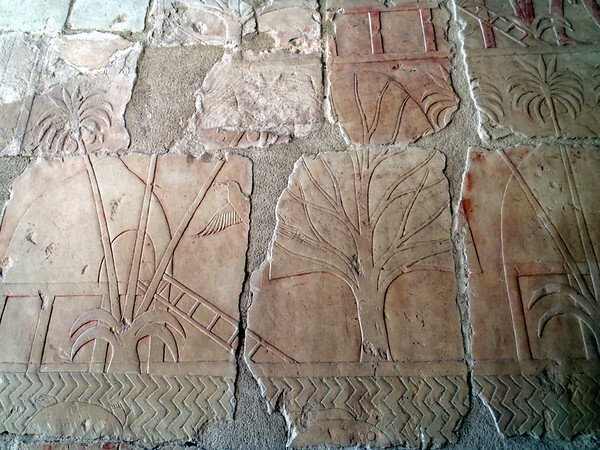 West bank of the Nile at Luxor. Folks were fishing, picnicking, and watering their cattle, and the passing scene was a calming relief from the noise and clamour of urban Luxor. The first mate brewed up sweet tea while the captain and I talked about life. When I told him I was not married, he quipped, “A life without a wife is like a kitchen without a knife!” For any topic he had a poetic quote rife with double meanings. Eventually the sun touched the horizon and the breeze died, so they dug out the oars and rowed us to shore. Back at the dock, the first mate stowed the sail and oars while William and I retired to a nearby restaurant for a Coke (for him) and Stella beer (for me), where we had friendly negotiations about the price for the tour. If you’re in Luxor and want a felucca ride on the Nile, look up William Shakespeare. Next up was a visit to the temple of Hatshepsut (info link), which was also empty of tourists but largely also empty of touts. 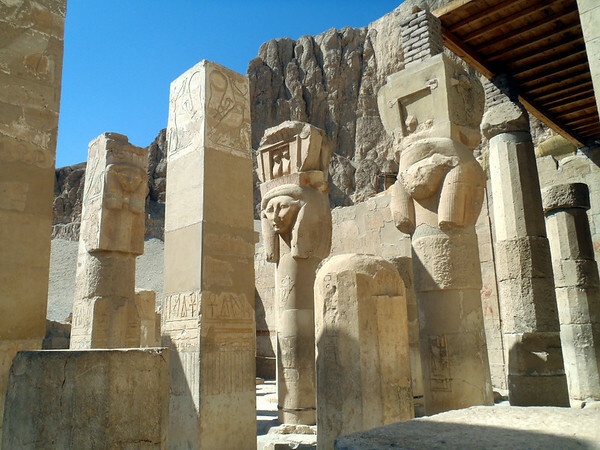 Temple of Hatshepsut, Luxor. Goddess Hathor depicted with cow’s ears. Back at the hotel, it was time to pack and head south to Aswan, where I would apply for a visa for Sudan and catch the weekly ferry to Wadi Halfa. That night, Mubarak stepped down from his 30 year pedestal, and the streets erupted with lots of cheering crowds, honking and gunfire! Ambulance driver and another local, chatty and hospitable. Tea was brewed and we had a conversation in “traveler sign language” about motorcycles and politics. Once in Aswan I followed the corniche and quickly found the Keylany Hotel. The next day I ambled up to the Sudanese consulate and applied for an entry visa. The helpful assistant Hagir told me to come back in “one week, maybe two”. This was not unexpected news, so I settled in to a lazy pattern of existence, passing time reading more books, buying a few gifts and exploring the local cuisine options. Feluccas on the Nile. After Mubarak fled to Sharm el Sheik, the tourists started filtering back in, much to everyone’s relief. After a few days, a German biker showed up, heading north from Kenya to Kyrgyzstan. He shared some useful tips for Sudan, and even gifted me maps for Sudan and Ethiopia. And during the second week, two more Germans appeared, both heading south. Chris (left) and Alfred in the hotel’s rooftop restaurant. After a week passed, I started to visit the Sudanese consulate for news on the visa. Each day I was greeted with a shrug, “No news today”. After two weeks, I inquired about the possibility of an “express” visa or “rush fee” — a polite way of offering a bribe. 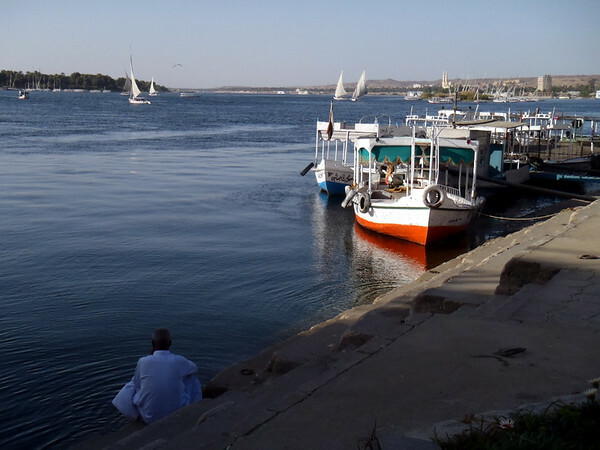 Passing time in Aswan was not unpleasant, but it did become mind-numbing and I felt myself losing momentum for the trip. No express visa was available, so I continued my daily pilgrimages to see the consul. Sudan was the key to accessing the rest of Africa from Egypt. Libya was out due to their own brewing political unrest. Saudi Arabia was not an option for Americans without a business visa (and from there, the onward options are limited anyway). There are no passenger ships from Egyptian ports to Djibouti. Each passing day brought me another day into spring, and soon Sudan itself would pass from uncomfortably warm to dangerously hot. Another pressing matter was the expiration of my carnet on August 1st, which is not renewable without purchasing a new guarantee. With much more delay I would find myself having to dash for Capetown and hurriedly exit to South America to avoid the extra carnet expense. After three weeks, I called it a day and decided to bolt north for Alexandria. There, a new ferry service would take me to Venice. I made Alex in two days, and holed up in a hotel on the corniche. 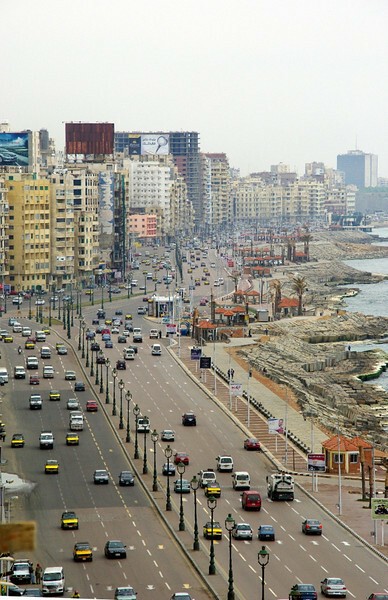 View of the corniche in Alexandria. I hunted down a cafe with wifi and caught up on the ferry details. 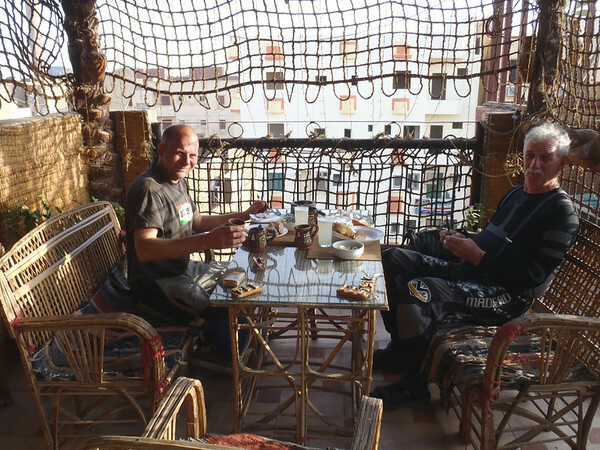 While in the cafe I met an American who was involved in a hydro/solar power project in Upper (southern) Egypt. He was a gracious host and a lot of fun to pass time with. On the morning of my last day, he took me to some of his favorite places in town, helped me find an internet cafe to print some needed documents, and we took a ride on the local tram, crowded in with local students and commuters. Being a long-time resident of Alexandria, he shared amusing and sometimes shocking insights into the local customs and habits. 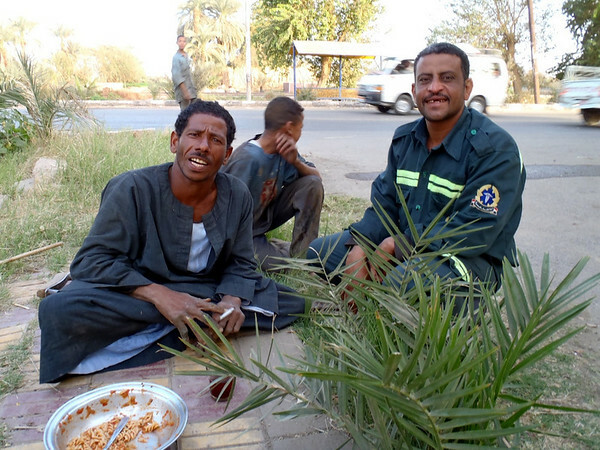 I was grateful for a bit of camaraderie during my last days in Egypt. Thanks Al! At the port of Alexandria I met a few other westerners who were overlanding through Egypt and taking the ferry onward to Venice. The exit process was surprisingly simple, due to the fact that some of the government offices were burned down during the revolution. Less legwork for worn out travelers! Throughout this whole blog, I’ve been looking at pictures wondering which one I’d select as the book cover, if I were you. It definitely be one of the photos of the bike, along some road somewhere. After reading these last entries, it seems like a no brainer. It’s the one in Sinai. “Windy day on the road in the Sinai. Windblown sand partially covers the highway.” was your caption. Safe travels, my friend. Hope to see you soon!